The Third Man (and Still Dots) ends with one of the most remarkable final images in the history of cinema, an overwhelming fusion of form and content that makes clear just how irrevocably Holly Martins’ life has changed. Jeremy charted this solemn transformation on Tuesday, tracing all of Holly’s medium-shots to close-ups throughout our series and discovering a man whose sense of morality has been upturned, who has discovered that the world is so rotten that shooting one’s oldest friend dead may in fact be an ethically justifiable act. Yet if Holly’s morals have been bolstered even in the face of such a sickening realization (revealing the fact that his ultimate aim, it seems, is to strive for some kind of innate yet indefinable human goodness — a reminder, perhaps, of his Catholic faith, which has been alluded to but hardly emphasized throughout the film), Holly is also undergoing an emotional crisis. He still loves Anna Schmidt — indeed, loves her precisely for her compassion, her unwavering loyalty to Harry Lime even once his evil deeds have been unearthed. His decision to work with Calloway to capture Harry, and of course his murder of his former friend, indicate that Holly has chosen an amorphous morality over friendship with Anna; he’s aware that his actions have ensured her ongoing animosity towards him. Following Harry’s “second” funeral, Calloway offers to drive Holly to the airport, presumably to return to the United States to begin what must certainly be an entirely new phase of his life. (Surely Holly can’t continue writing hackneyed Western paperbacks, given his discovery of how knotty human morality and relationships actually are; maybe he’ll initiate a second career as a modernist James Joyce acolyte?) Seeing Anna walking alone at the side of the road, Holly asks Calloway to pull off to the side. “There isn’t much time,” Calloway reminds him; and more to the point, a second later, well aware of Holly’s desire for a final farewell with Anna, Calloway advises Holly to “be sensible.” Holly replies, “I haven’t got a sensible name, Calloway,” reminding us of Anna’s of final dig towards Holly in the Cafe Marc Aurel: “Honest, sensible, sober, harmless Holly Martins. Holly — what a silly name.” In other words, it’s not just Harry’s funeral that’s being repeated here: almost all of this scene, from Calloway offering Holly a ride, to spotting Anna on the side of the road, to an admonition of Holly’s insensibility and absurd name, is an echo of something that has come before. Yet, as Jeremy pointed out on Tuesday, Marx’s aphorism that all historical events repeat themselves, first as tragedy, then as farce, may be inverted by their sequencing in The Third Man: Holly first arrived in Vienna a naive, idealistic Romantic; now hardened into a weary realist, he perceives the same events through a morose veil of tragedy and sacrifice (a sacrifice of innocence, of happiness). The emotional rift between Holly and Anna is conveyed through a remarkable aesthetic decision: we witness Anna stroll past Holly, without a word or even a glance in his direction, in a single unbroken shot that lasts over a minute. Still Dots 102 is a fragment from this long take; indeed, Anna has already been walking for about forty seconds when she reaches this point. Certainly such an extended take seems extraordinary in today’s cinematic climate, in which most mainstream films, edited into unmalleable form by cuts lasting an average of two or three seconds, dictate precisely what the audience sees (and how) and fractures scenes into a multitude of fragments. But even at the time of The Third Man‘s release, the Hollywood style of continuity editing (and, by extension, the style adopted by most narrative films internationally) had already accustomed audiences to sporadic edits within scenes: cut-ins, cutaways, close-ups, POV shots, establishing shots, inserts, and other pieces of film vocabulary which convey emotion, theme, and information by purely visual means. This is partially why The Third Man‘s last image hits us so hard: it seems anomalous even within the film itself, which typically edits much more frequently. 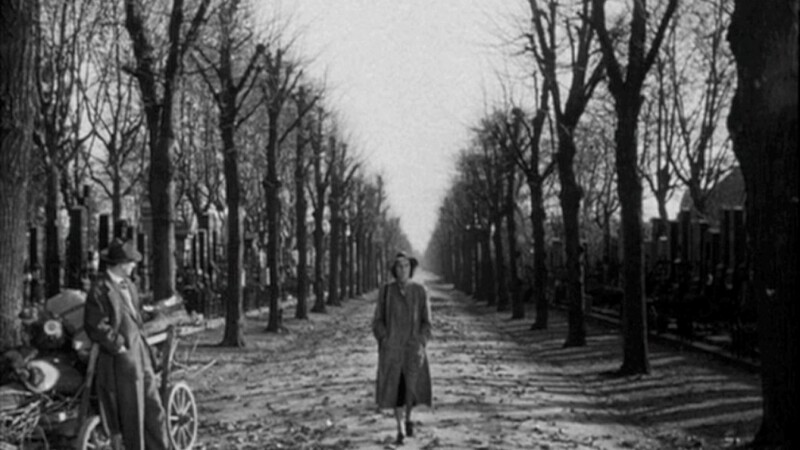 We watch Anna walk and walk and walk, as the leaves fall drearily and Anton Karas’s zither score swells; we get the sense of life irrepressibly moving on, even during times of great personal anguish. Still Dots 100: Holly stands at the center of the frame’s vanishing point, perched at a turning point in his life. Image © Studio Canal. We may remember a similar composition from last week: in Still Dots 100, we see Holly Martins immediately after his murder of Harry Lime, a silhouette at the vanishing point in the center of the frame, teetering precariously at a drastic turning point in his life. The swath of darkness and bold locus of light represent truth and unknowing, though which of these Holly has passed through and into which he’s about to step are more ambiguous. Today’s frame, while vastly different in lighting and narrative content, has a similar composition: a single human figure beginning as a distant shape in the center of the frame. The difference is between moral belief and emotion, or perhaps even between death and love: if Still Dots 100 showed us a Holly Martins who was about to venture down a passageway of cold, harsh reality, then Still Dots 102 shows us the same man suffering from a brutal emotional epiphany — the realization that he may never again see or speak to the woman he loves. Holly’s incongruous position at the side of today’s frame emphasizes how he doesn’t belong, either in this city or in Anna’s life, which will continue without him. We should remember here that this ending very easily could not have been: Graham Greene was pushing for a happy ending, in which Holly caught up with Anna, who would be unable to resist his blusterous American charm and walk down the promenade, arm-in-arm. Carol Reed was the one who pushed for this bleaker, more realistic ending, alleging that a more generic happy ending would in fact be “unpleasantly cynical,” taking place immediately after Harry’s funeral. Richard Raskin, in his excellent essay “Closure in The Third Man: On the Dynamics of an Unhappy Ending,” points out that most critics interpret Anna’s climactic snub of Holly as proof of the filmmakers’ own disparaging view of their protagonist — in other words, that Holly, the foolish, naive, clumsy American who caused (either directly or indirectly) the death of three people, “deserves” this unhappiness. Raskin disagrees, as do I: though Holly is indeed foolish and out of his element (a point Jeremy and I have reiterated several times), he is ultimately simply a human trying to enact goodness and honesty rather than evil and corruption, which is essentially what most human beings strive for in their fleeting lives on this planet. Raskin cites Lynnette Carpenter, who claimed that the film sympathizes with Holly’s attempt to reconcile his optimism with his burgeoning cynicism, and in so doing “advocates humanity and compassion in the face of increasing pressure to categorize, generalize and dehumanize, a pressure that leads, when unresisted, to totalitarianism.” The fact that Holly and Anna don’t happily end up together is not proof of Holly’s mediocrity as a man, especially in comparison to Harry Lime; instead, it offers a viewpoint of love and relationships as wearily realistic as the film’s viewpoint towards human morality. People may never have a list of objective ethical criteria by which they lead their lives, but we try nonetheless to be good, aspiring to a vague principle of justice; similarly, in a perfect world love would always be requited and directed towards the appropriate counterpart (and never threatened by inane amendments), but this simply (and tragically) is not the case. The bleak ending of The Third Man is a heartbreaking realization of this. 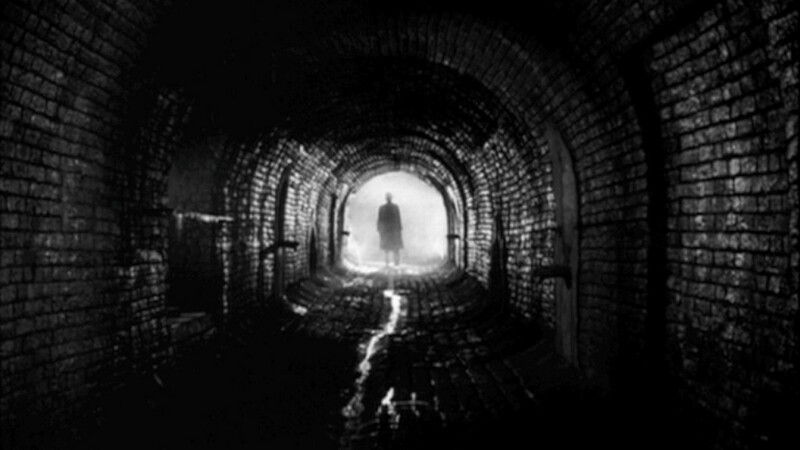 When Roger Ebert wrote, “of all the movies that I have seen, this one [The Third Man] most completely embodies the romance of going to the movies,” he may have been thinking primarily of this ending. (Ebert himself describes the final shot as “absolutely perfect,” “a long, elegiac sigh.”) Every time I see it (and I’ve watched The Third Man about half a dozen times now), it blindsides me, aching with sadness and beauty in a larger-than-life way that only movies can accomplish. Harry’s life has been ended, Holly’s and Anna’s discombobulated, but as Jeremy noted on Tuesday, Vienna “keeps moving as it has been.” Of course the city is not impervious or ahistorical; indeed, Vienna revealed itself to be one of the most wounded cities in World War II, a city whose scars parallel the human characters’ suffering. But if the city is The Third Man‘s “true hero and most complex character” — a notion with which Charles Drazin agrees — then it is heroic and complex precisely because of the human dramas that play out within it. All Vienna can do is bear rapt, silent witness to the violence and cruelty, or (as The Third Man is careful to suggest) love and goodness, that are staged within its borders. Just as the camera eye can only look on, mutely yet emotionally, the disembodied being of Vienna likewise provides a proscenium for the human passions enacted in The Third Man. Wim Wenders made a similar connection between cinematic and (for lack of a better word) metropolitan observation in his one-of-a-kind cine-essay, Notebook on Cities and Clothes (1989). 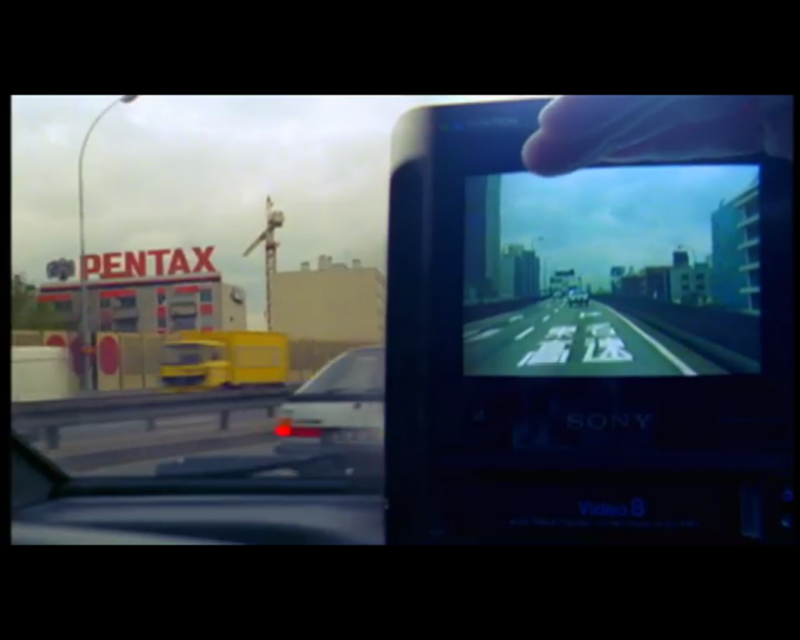 A digital camera observes the small dramas that play out in the modern metropolis in “Notebook on Cities and Clothes.” Image © Anchor Bay Entertainment. Where will Holly Martins go from here? It is one of art’s wonderful limitations that it can only offer us a slice of life, an interval; The Third Man‘s ending pains us precisely because we care so much for Holly and Anna (and Calloway), yet can only imagine what awaits them extra-diegetically. The British radio series The Lives of Harry Lime (1951-2), in which Orson Welles reprises his legendary role (and even contributed some of the scripts, harkening back to his Mercury Theater radio days in the 1930s), provides some lighthearted anecdotes from Harry’s black-market days before the arrival of Holly Martins, but as for the other characters’ post-Third Man days, we can know nothing — except for the movies that might play out in our heads afterwards. And what about the movie itself — is there more to be said about it? Of course; no exploration of a great work of art can ever be inexhaustible. There are also the real-life inspirations for the characters of Harry Lime and Holly Martins (allegedly based on a real-life Soviet spy and a Viennese journalist, respectively), the ways in which The Third Man dazzlingly complicates notions of the auteur theory (with director Carol Reed and screenwriter Graham Greene, both then at the height of their popularity, vying for the title of “auteur” along with Orson Welles and significant collaborators like cinematographer Robert Krasker and music composer Anton Karas), and the connections between the film and literary modernism. But finality must come to all things, even if (as it is for The Third Man‘s characters) that finality seems achingly inconclusive. At the very least, we hope these Still Dots posts have revealed just how multifarious and complex The Third Man is, how fluidly it moves back and forth between registers of visceral, invigorating entertainment and implicit thematic commentary. The “essence” of cinema (if such a thing exists, which, hopefully, is not the case) is fascinating because it hovers somewhere between the domains of photography and movement, or space and time, which we hope our project has also intimated. At some point in the next several weeks, Jeremy and I will be posting a follow-up article about our experience undertaking Still Dots over the last year, a project which seems to have gone by in the blink of an eye (or in one-twenty-fourth of a second?). And on January 17, 2013, the Walker Cinema will be hosting a free screening of The Third Man to commemorate the end of our project (and, more importantly, to provide audiences with an opportunity to see this masterpiece on 35mm!). In the meantime, as Anna continues down her road and Holly, a changed man, smokes a cigarette alone somewhere in Vienna, all we can do is imagine the scenes that transpire after the film runs out. Over the absolute length of one year — two times per week — Still Dots has grabbed a frame every 62 seconds of Carol Reed’s The Third Man. This project began on December 13, 2011. For a complete archive of the project, click here. For an introduction to the project, click here.